In the chaos of Brexit, former Foreign Secretary Boris Johnson has revealed his alliance with Breitbart editor and Cambridge Analytica founder Steve Bannon. But, the FBI is coming and Johnson is playing with fire. During the Parliamentary debate on the day of the ‘meaningful vote’ over Prime Minister Theresa May’s Brexit deal, Boris Johnson warned that failure to withdraw from the EU would lead people to conclude “there is a plot by the deep state to frustrate Brexit”. This invocation of the ‘deep state’ conspiracy is telling. The phrase is an American import often used to defend US President Donald Trump against mounting evidence of Russian collusion, the subject of a two-year long investigation by the Department of Justice and the FBI, led by Special Counsel Robert Mueller. Though it has already led to dozens of indictments and the jailing of former Trump campaign manager Paul Manafort, to Trump defenders, the Mueller investigation is the most obvious example of a ‘deep state’ conspiracy led by the liberal elite. The line is regularly deployed by ‘Alt Right’ channels like Alex Jones’ Infowars and was even repeated by President Trump himself who railed against the “Deep State Justice Department”. But, how did this Trumpian phrase make its way across the Atlantic into the rhetoric of the would-be Tory leader and successor to Theresa May? There’s little doubt Boris Johnson was inspired in his deep state rhetoric by Steve Bannon, the campaign manager of Donald Trump who succeeded the now imprisoned Paul Manafort. The depth of Johnson’s friendship with Bannon has been underestimated. They reportedly first met when Bannon was in the White House in early 2017 and have been in contact ever since. Though Bannon has been close to Nigel Farage for many years – and more recently has praised far-right activist Stephen Yaxley Lennon (AKA ‘Tommy Robinson’) – this summer he said that Johnson “would be a great prime minister” and should challenge Theresa May. So, it’s Bannon who would have inspired Johnson to deploy the conspiracy theory. Though he prefers calling it the ‘administrative state’, Bannon’s Breitbart websites pushed it constantly when he was in charge. The Brexit version was deployed only a few days before Johnson’s parliamentary intervention by Breitbart London regular James Delingpole. But, so what? What if Johnson borrows from the populist playbook of Trump’s campaign strategist? The problem for Boris Johnson is that Steve Bannon is a key subject of the FBI investigation into interference by another more hostile deep state – that of Vladimir Putin’s Russia. And the former Foreign Secretary knows all about it. As a famous populist trying to build a right-wing nationalist global ‘movement’, Stephen Bannon is often invited on British TV or newspaper events as a controversial but important voice. However, Bannon’s role as vice president and co-founder of the now defunct Cambridge Analytica is rarely scrutinised, although it was that company’s role in Trump’s election which is a key focus of Robert Mueller’s ongoing probe into Russian influence operations. Having taken over the Breitbart websites in 2012 with the backing of billionaire hedge fund owner Robert Mercer, Bannon turned his attention to the UK a year later. In late 2013, just as he was recruiting Raheem Kassam, Milo Yiannopoulos and James Delingpole to a new site Breitbart London, Bannon was setting up Cambridge Analytica with the SCL Group, a psy-ops and communications company contracted by the Ministry of Defence and with X-List access to secret documents. Bannon likes to describe his polemical right-wing publishing ventures as his ‘weapons’ and there is mounting evidence Cambridge Analytica’s microtargeting and psychometrics were weaponised in alliance with his news site. Cambridge Analytica was an exclusive reseller of Breitbart data, and the principle of ‘information operations’ – as revealed by former head of research Chris Wylie – was not to bombard targets with ads or obvious propaganda, but change the reality around potential voters with misinformation and ‘fake news’. Since it was closed down last year, Cambridge Analytica has pleaded guilty to data crimes and remains the subject of the biggest investigation ever by the UK’s Information Commissioner after it was revealed that it used hacked data from more than 70 million Facebook users. Before it became the main electioneering arm of Trump’s presidential campaign, Cambridge Analytica claimed it played a crucial role in Brexit. Its Canadian offshoot, AIQ, was the main beneficiary of the spending by the official Vote Leave campaign. Boris Johnson was the most high profile member of Vote Leave. Cambridge Analytica executive Brittany Kaiser was present at the launch of Nigel Farage’s alternative Leave.EU campaign and, after the Brexit vote and Trump’s victory, both the company and campaign boasted of working together, and that Brexit was a ‘petri dish’ for Trump. Bannon’s role in all this cannot be ignored. It was central. This was acknowledged by former UKIP leader Nigel Farage on the Breitbart website after the Brexit vote, as he raised a pint of beer and said. 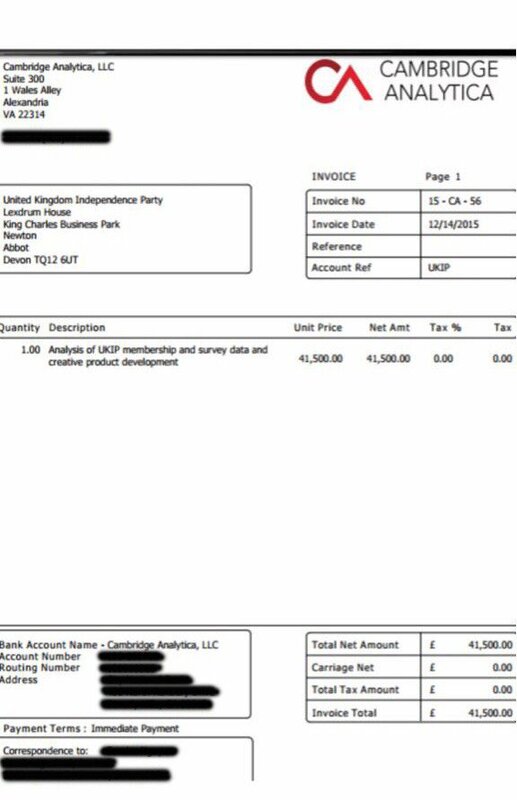 Though Farage’s Leave.EU backer Arron Banks subsequently denied ever having worked with Cambridge Analytica, an invoice obtained via Byline by the Observer last year revealed services worth over £40,000 performed by the electioneering company for UKIP. But, the redacted address for the payment was not Cambridge Analytica’s London base, but… Steve Bannon’s LA-based company Glittering Steel. While Bannon’s role in Brexit has been largely concealed, Johnson will not be able to avoid the likely progress of Robert Mueller’s investigation in the company’s possible collusion with Putin’s intelligence services. Cybersecurity expert Chris Vickery has found many more Russian links in Cambridge Analytica data. Cambridge Analytica worked on electioneering data with the Putin controlled petroleum company Lukoil. The Cambridge academic who accessed the psychometric data went on to work at St Petersburg University, studying the ‘dark triads’ of internet trolling. Sam Patten, who worked on Cambridge Analytica microtargeting in the US, formed a company with Konstantin Kilimnik, believed by the FBI to be Manafort’s Russian intelligence contact. General Michael Flynn, still awaiting sentencing for hiding his Russian contacts from the FBI, became a Cambridge Analytica consultant during the Trump campaign. These lines of inquiry have been given more urgency by the recent revelations from Paul Manafort’s defence papers that he passed crucial voter data to a Russian agent and was focused on the US states Wisconsin and Michigan. These marginal states, which Trump surprisingly won and paved his way to the White House, were targeted by both Putin’s Troll Farm (the Internet Research Agency) AND Cambridge Analytica. The overall arc of Mueller’s investigation begs the overwhelming question: did Bannon’s Cambridge Analytica work in tandem with Russia in the 2016 elections? If anyone knows what the ‘deep state’ of the UK is up to, it should be Boris Johnson – an alumnus of Eton and Oxford, a former editor of the Spectator, lead Telegraph columnist and former Mayor of London. But it’s his last official role as Foreign Secretary, from July 2016 to July 2018, when his alliance with Bannon flourished, which really puts Johnson on the spot. These two years are the key phases of the alleged Trump campaign collusion with Putin – a campaign supervised first by Manafort and then by Bannon who continued as a key figure through the transition period and into Trump’s White House. As Foreign Secretary, Johnson must have been briefed on these matters of urgent national interest and the potential foreign subversion of Britain’s biggest ally. The head of the Secret Intelligence Service (MI6) reports directly to the Foreign Secretary. It was a dossier written by the former chief of MI6’s Russian desk, Christopher Steele, which has provided a road map for FBI Counterintelligence and the Mueller inquiry into Trump and Putin. Even if Johnson had no intelligence briefings prior to Trump’s election, he would have certainly been taken through the evidence when the Steele dossier was published by Buzzfeed in January 2017. Day-to-day responsibility for GCHQ also belonged to Johnson during this time at the Foreign and Commonwealth Office, and the signals intelligence agency was one of the first to become aware of suspicious “interactions” between Trump and Russian agents. When the White House accused GCHQ of spying on Trump on Obama’s orders, the intelligence agency was forced to issue a rare rebuke. Such a high-profile issue must have been discussed at the most senior levels. There are various other UK-based strands of the Mueller inquiry Boris Johnson should also have been briefed about. The FBI inquiry into Russian connections to Trump began in London in May 2016 when a member of Trump’s national security team, George Papadopolous, started boasting that Russia had “dirt” on Hillary Clinton in the form of “thousands of emails” to the Australian Ambassador in a Kensington bar. When Papadopolous’ indictment for lying to federal agents was revealed in the summer of 2017 more British connections became clear. It was in London, working for a Maltese born Professor, Joseph Mifsud, when Papadopolous was first approached about the Russian dirt on Clinton, with promises of an introduction to the Russian Ambassador in London and a relative of Vladimir Putin. Papadopolous has since told me he met with Tobias Ellwood, a Ministry of Defence minister, on “numerous occasions”. Boris Johnson pictured at a 2017 dinner with the ‘London professor’, Joseph Mifsud (left) and Prasenjit Kumar Singh. Meanwhile, as I revealed on Byline and Carole Cadwalladr in the Observer, Joseph Mifsud was boasting as late as October 2017 that he was meeting with Boris Johnson to discuss ‘Brexit’. Photos of the meeting soon were soon found on Facebook. This meeting with Mifsud was brief and probably innocuous. But, when it comes to his years-long alliance with Steve Bannon, Boris Johnson cannot be so innocent. Even if, because they have not been properly covered by media in the UK, Johnson could claim doubt about Bannon’s role in Brexit, he will not be able to avoid the conclusions of the Mueller inquiry and the role of Bannon and Cambridge Analytica in Trump’s campaign. Many of them cover incidents which coincide with both his position in charge of two of Britain’s intelligence services and his growing friendship with Bannon. Mueller’s report will conclude that the main conspiracy in the US 2016 elections involves the Russian state and Vladimir Putin, and likely collusion with Trump officials. The exchange of data between Cambridge Analytica and Russia will probably feature. His reports or future indictments may well provide more evidence of the Kremlin’s interference in the EU Referendum and leads to collaborators this side of the Atlantic. If any of those happen, where will Johnson’s invocation of the deep state conspiracy theory take him? The kindest explanation for his taking up Bannon’s rhetoric is that Johnson is willing to use any populistic tactic to boost his career, even if that means undermining the civil service, law enforcement and intelligence services at home and abroad. That’s not a great look for a would-be Prime Minister. But there is a darker possibility. In the US, the ‘Deep State’ trope has been used to discredit Mueller’s findings even before they are published. Is there a chance Johnson knows what’s coming, and how it implicates figures around Brexit, and is getting the defence in advance? Roger Stone's speakerphone conversation with Trump about Wikileaks and hacked emails coincides with a secretive meeting between Stone and Nigel Farage at the Republican National Convention in Cleveland that year.